"The best oldies group around. "These guys will blow you away. The group was formed in 1997, and two of its members, Lee Halvorsen and Joel Just, have been with the group since its inception. While other groups have come and gone during that time, 4 Ever Young continues to add new songs and fine tune its repertoire to become more and more polished and entertaining. The group enjoys an active performance schedule, regularly entertaining folks at private parties, corporate events, banquets, restaurants, and conventions. The group has performed at a variety of venues, with notable public engagements at Rangers Ballpark in Arlington, Dallas Convention Center, Fair Park, and Morton H. Meyerson Symphony Center, and a featured television appearance on Channel 21 (UPN/KTXA). Although they perform regularly as an a cappella group, in 2011, 4 Ever Young joined forces with a band consisting of guitar, bass, saxophone, and drums, with the vocalists playing keyboard, rhythm guitar, and percussion, for occasions requiring a full 50s band experience. The combined group, 4 Ever Young and the Reflections, has performed at events including GrapeFest, the Sounds of Lewisville concert series, and Keller Crawfish Krawl, to name a few. 4 Ever Young is proud of its community service efforts. It is a registered member of A.R.T.S. For People, a non-profit organization that brings the arts to those in need. In addition, the group regularly donates performances to the American Cancer Society. Justin Neth (Bass) is a U.S. Army veteran and accomplished instrumentalist, who also sings professionally with The Texas Voices and Uptown Carolers. Joel Just (Baritone), a multi-talented vocalist, has twice sung on the hallowed stage of Carnegie Hall in New York. He is a studio vocalist who also sings bass with Uptown Carolers and baritone with professional chamber choir The Texas Voices, in which he is often featured as a soloist. Lee Halvorsen (2nd Tenor), a veteran of numerous close harmony ensembles, is an accomplished song writer and solo artist who has had the honor of singing our National Anthem at The Ballpark in Arlington on numerous occasions. Rex Reynolds (1st Tenor), has sung professionally at all voice parts from 1st (high) tenor to 2nd (low) bass. His résumé as an ensemble singer and soloist includes the Dallas Symphony Chorus, the Living Christmas Card, and The Texas Voices. Rex is currently pursuing the Guinness World Record for "largest vocal range." 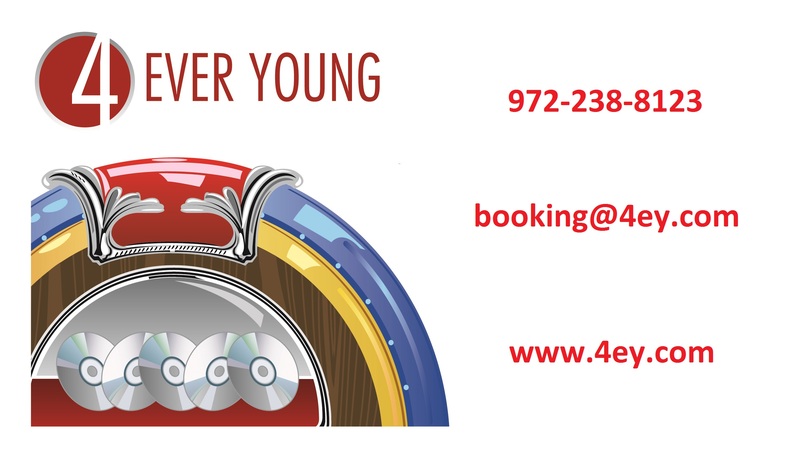 For more information about 4 Ever Young, see the Booking page.